¡Gracias al Festival Internacional de Cine de Cartagena De Indias (ficci 56) por la oportunidad de proyectar cortometrajes del festival a nuestros estudiantes de Preescolar a 12 grado! Fueron historias llenas de creatividad con mensajes importantes acerca de nuestro mundo. Mañana miércoles 09 de marzo, se enviarán a casa con su hijo(a) los resultados de las pruebas de Audiometría y Visiometría, realizados durante la semana del 22 al 26 de febrero a todos los estudiantes interesados de 1 a 12 grado. Por favor recuerden a sus hijos(as) entregarlos para conocer los resultados y por favor recuerden guardarlos en los archivos médicos de sus hijos(as) en casa. El domingo 6 de marzo en el Coliseo de Combate de la ciudad nuestro colegio obtuvo el 1er lugar general con Martina Prieto en la categoría hasta 8 años, plata en gimnasia y bronce en flexibilidad y fuerza. 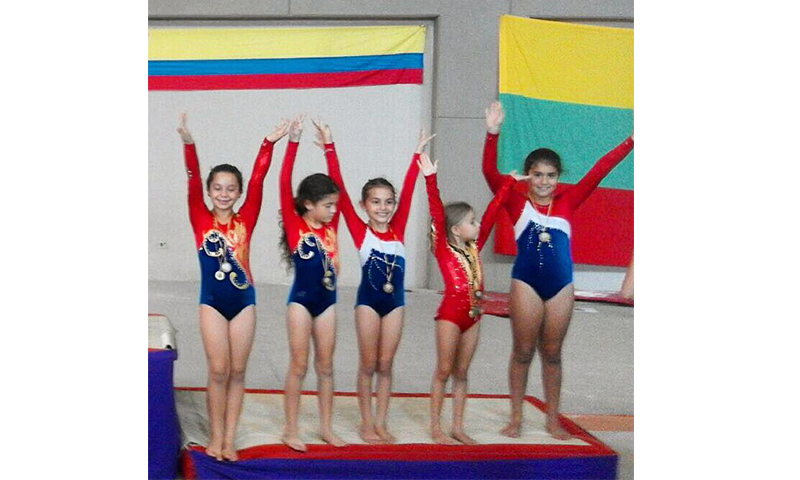 En la categoría de 9 a 10 años COJOWA obtuvo Bronce por equipos, plata en gimnasia con Dominique Jattin y Bronce en Fuerza con Silvana Aristizabal. ¡Felicitaciones a estas estudiantes y sus entrenadores por su trabajo y dedicación! 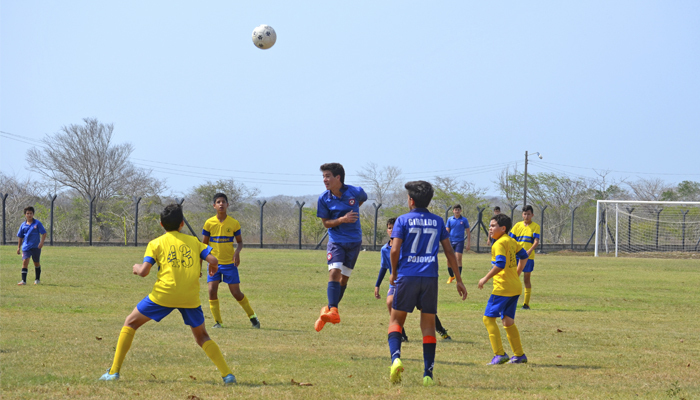 ¡Gracias a todos los colegios participantes y entrenadores por disfrutar del deporte con nosotros! La Universidad De La Sabana los invita a la conferencia “Educar para la felicidad” tema de gran importancia para cualquier etapa. La conferencia será dictada por el Dr. Cristian Conen. 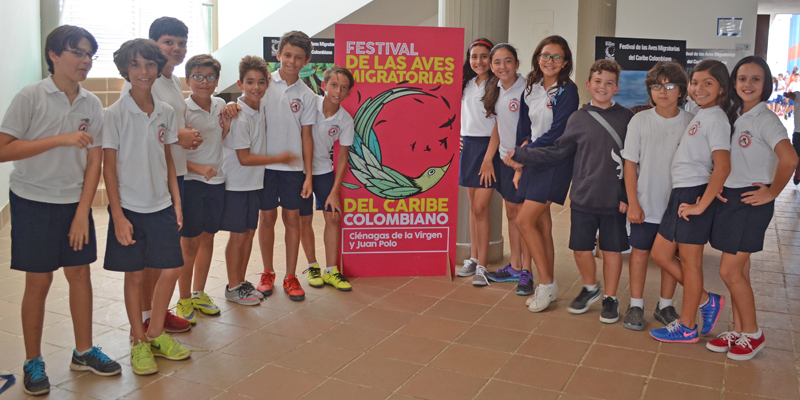 La Fundación Ecoprogreso en el marco de su II Festival de las Aves Migratorias del Caribe colombiano “Cartagena anfitrión de las aves” estuvo presente en el colegio con la exposición fotográfica “Diversidad de aves migratorias en las ciénagas de la Virgen y Juan Polo” que tiene por objeto familiarizar estudiantes sobre la diversidad de las aves migratorias y su belleza. Así como interrelacionar conocimientos científicos con el arte y prácticas de reciclaje, transmitiendo el mensaje: “diviértete, aprende y actúa”. Los estudiantes de 5 y 7 grado también asistieron a un taller sobre aves migratorias el pasado viernes 4 de marzo. ¡Gracias a Ecoprogreso por esta maravillosa oportunidad de aprender más sobre nuestras aves y su importancia! 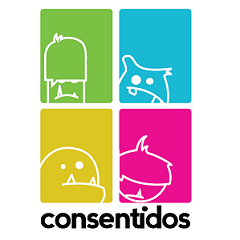 ¡Les deseamos éxito a nuestros Juniors y Seniors! Un alumno de High School frecuentemente colabora organizando las bandejas de la cafetería al ver que quedan en desorden. ¿Cuáles son las herramientas básicas para que padres, madres y cuidadores puedan poner límites útiles y eficaces ante el consumo de alcohol por sus hijos menores de 18 años? Si desea conocer un poco más sobre qué aprenderá durante la conferencia, por favor presione AQUÍ para observar un video al respecto. 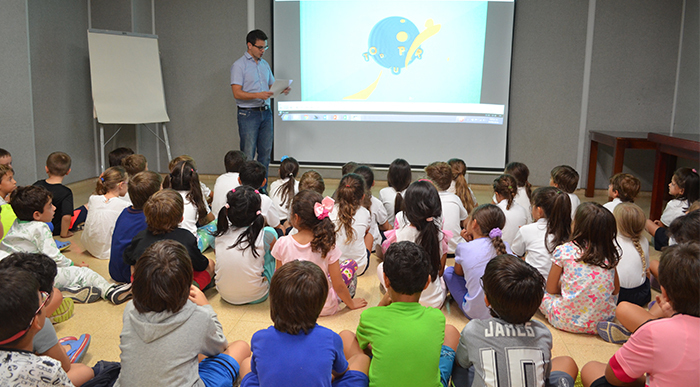 We wish to thank the Festival Internacional de Cine de Cartagena De Indias (ficci 56) for the opportunity to project short films to our students from preschool to 12th grade! The short films were filled with creativity and important messages about the world. 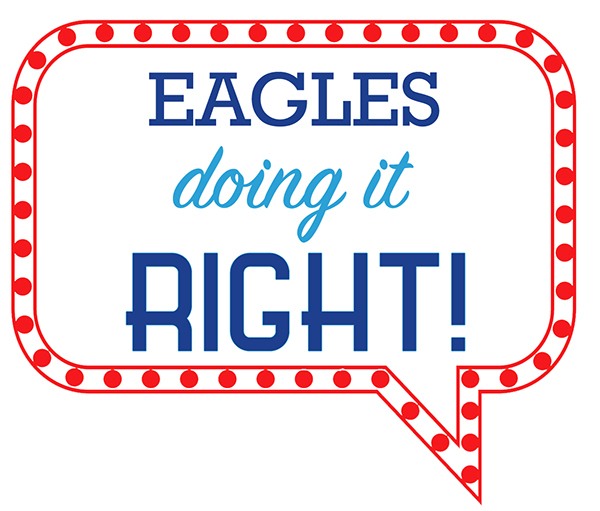 Tomorrow, Wednesday, March 9th, we will be handing your son/daughter the results of their hearing and vision exams, which all interested 1st to 12th grade students had during the Feb. 22 – Feb. 26 week. Please remember to ask him/her for these results to find out how they did, and remember to keep them for your children’s medical records. On Sunday, March 6th at the city’s Coliseo de Combate our school achieved general 1st place in the 8 year-old category with Martina Prieto. In the same category we also achieved Silver in Gymnastics, and Bronze in Flexibility and Strength. 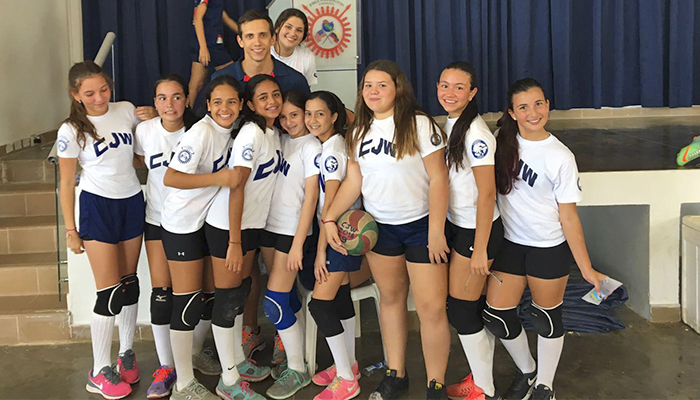 In the 9-10 year-old division we achieved Bronze as a school, silver in gymnastics earned by Dominique Jattin, and Bronze in Strength achieved by Silvana Aristizabal. 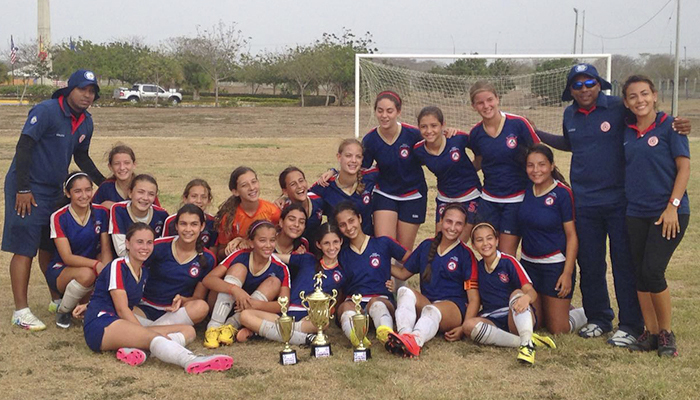 Congratulations to these girls and their coaches for their hard work and dedication! 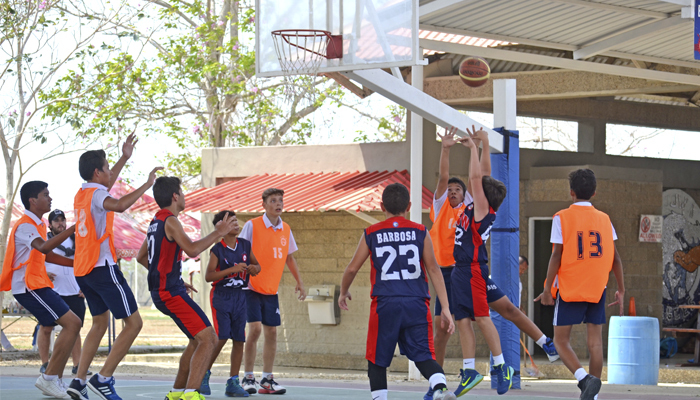 We thank all participating schools and coaches because they enjoyed with us these two sports-filled days! 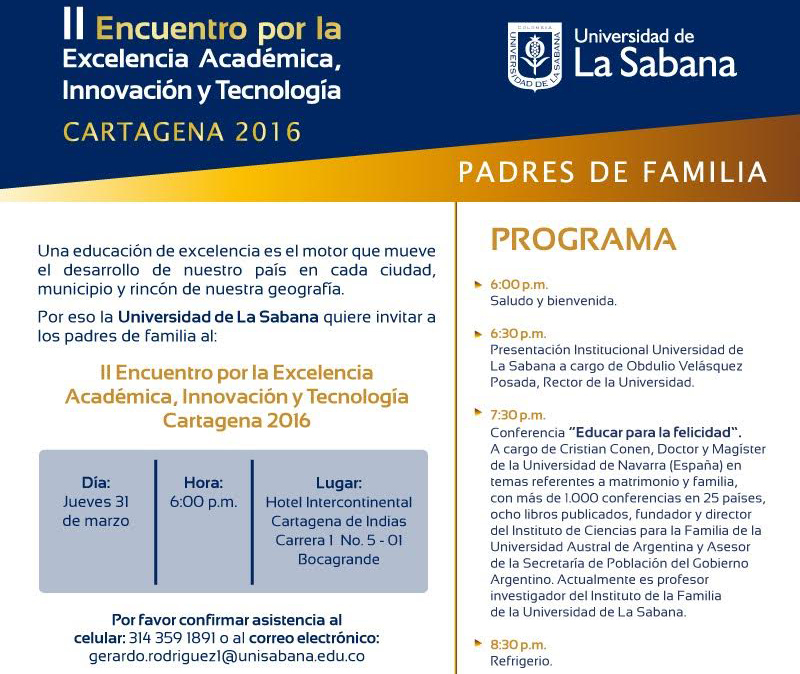 La Sabana university invites all parents to the conference: “Educating for happiness” (the conference will be in Spanish), a topic of great importance regardless of the development stage of your child. 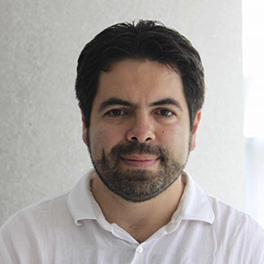 The conference will be in charge of Dr. Cristian Conen. 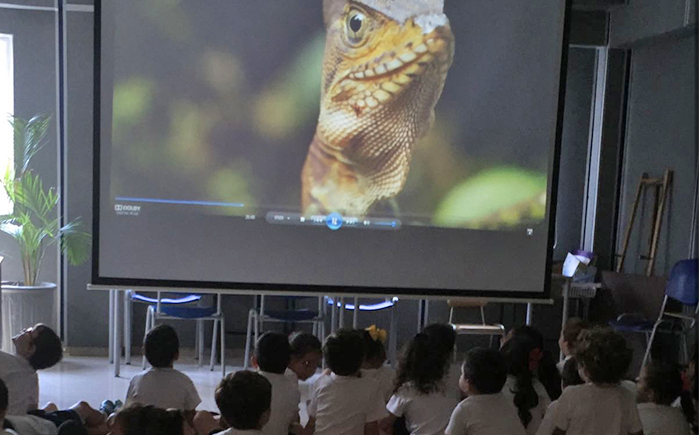 The Ecoprogreso Foundation within their II Festival of Migratory Birds of the Colombian Caribbean “Cartagena Birds Host”, was present at the school with their photography exposition of “Migratory Birds Diversity of the Ciénaga De La Virgen and Juan Polo Swamps” the purpose of this exposition was to familiarize students about the migratory birds diversity and their beauty. As well as connect scientific knowledge with art, and recycling practices, transmitting the message: “have fun, learn, and take action!” The 5th and 7th grade students also attended a workshop about migratory birds in Friday, March 4th. You don't need to come all the way to our Zona Norte campus any longer to pay for your children's monthly tuition. 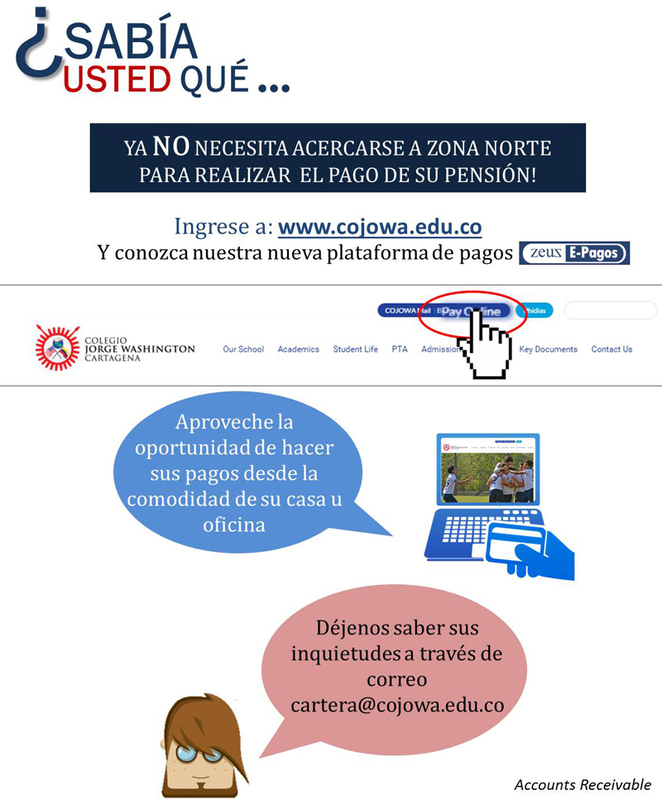 Please visit our website http://www.cojowa.edu.co/ and visit our online payments platform. 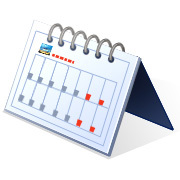 Take advantage of the opportunity to make all your payments at home or at your office. We wish our juniors and seniors peace of mind and success on their tests! A high school student frequently cooperates organizing the cafeteria trays when he sees they are left in disarray. Tips to set limits to alcohol consumption and not die trying! What are the basic tools that parents need, to set useful and efficient limits to alcohol consumption for their underage son/daughter (under 18 years old)? If you wish to find out more about what you’ll be learning during the conference, please click here to view a video on the topic.